"evokes nostalgia for many an audience member"
Mamma Mia! has long been a West End veteran, opening at London’s Prince Edward Theatre back in 1999. Fast forward eighteen years and how does this jukebox musical compare to more recent theatrical offerings that delve into the oeuvre of musical greats such as Cyndi Lauper and Bob Dylan? To be honest, these shows are almost impossible to compare as it is truly the music that sets these pieces apart. I believe you will be hard-pushed to find a single person who has not heard of at least one ABBA song in their life, and this is why Mamma Mia! has been entertaining audiences worldwide for almost two decades. This toe-tapping, hip swaying homage to one of the most popular pop bands of all time is a fun and frivolous few hours in which classic ABBA songs are woven into an interesting and original plot. The book, written by Catherine Johnson, follows the story of Sophie (Madeleine Leslay), who longs to find her biological father to walk her down the aisle. Upon finding her mother Donna’s (Sara Poyzer) diary, Sophie learns that she has not one but three potential fathers in the mix. Of course, things don’t go to plan and as the story unfolds, and Donna learns that her three past lovers are all on the island at the same time, on the eve of her daughter’s nuptials, a humorous yet heartfelt series of scenes, songs and dance ensues. Whilst it's fair to say that Mamma Mia! does verge on being dated, with the gaudy costumes, euro-pop disco ballads and camp dance routines, it is precisely this that creates an almost time-capsule piece which evokes nostalgia for many an audience member. That’s not to say that the audience are all mostly 70’s babies who grew up with Eurovision! I was pleasantly surprised to see audience members both young and old, all from different parts of the world sitting in the auditorium of the Novello. The songs of ABBA transcend time and place, it seems, transporting enthusiastic audience members to a time where anything can be cured with a song or dance. 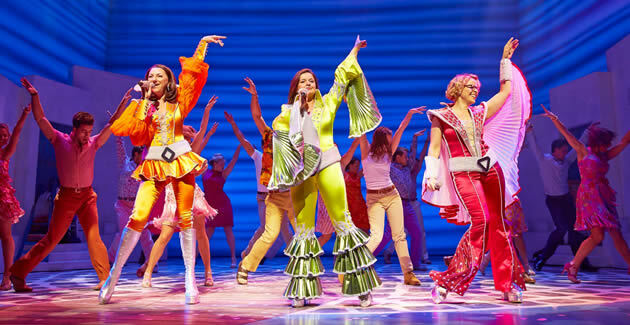 Songs such as the musical’s namesake ‘Mamma Mia’ and ‘Does Your Mother Know’ pepper the show throughout, in a way that feels clever, thought-through and poignant rather than crow-barred in. A special mention must go to Madeleine Leslay, who gives a bright and heartfelt performance as Sophie. The ensemble are particularly impressive too, with high-energy, perfect dancing all round – flippers and all! The backflips, breakdancing and boyish rowdiness from the male ensemble is particularly impressive, giving the performance a cheeky and contemporary update. It is perhaps true to say that Mamma Mia! will not float everyone’s boat. However, I am almost certain that by the end of the show, encores and all, almost every single audience member is stood up, singing and swaying, using their applause as a means to thank the talented cast and orchestra for the music.